*Updated Nov. 26: Bennett Kayser and City of Bell Mayor Fidencio Gallardo have dropped out of the race to support Jackie Goldberg. Teachers, elected officials and parents are among the 17 candidates who have filed their intention to run in LA Unified’s special election in March to fill the board seat that has been vacant since Ref Rodríguez stepped down four months ago. Board District 5 represents almost 100,000 students — 89 percent are Latinos and 85 percent live in poverty. Nearly 4 in 10 of the district’s elementary and middle schools are in the lowest categories in both math and reading on the state’s academic achievement accountability measurements. Only six schools were in the top category, meaning the students were proficient in both reading and math. 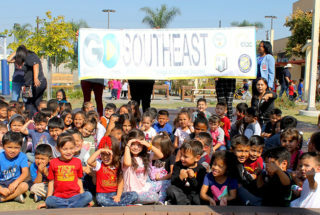 The district’s 180 schools serve a diverse group of communities that extend from northeast Los Angeles — Highland Park, Lincoln Heights and other white and affluent neighborhoods such as Silver Lake and Los Feliz — to the low-income and heavily Latino communities of southeast LA, like Huntington Park, Maywood, Cudahy and South Gate. District 5 has the second-highest concentration of Latino students, representing almost 89 percent of the student population. Over a quarter of the students are classified as English learners, and 11 percent require special education services. More than 85 percent live in low-income households, and an estimated 2,000 students are homeless. Within the boundaries of District 5 are about 180 schools, including 36 independent charters, 13 percent of the 276 independent charters in LA Unified. There are 85 elementary schools, 34 middle schools, and 27 high schools, including charters and magnets. The rest are span schools (elementary and middle, middle and high, or elementary through high school), early ed centers, special ed centers, and adult schools. According to an analysis of state data from District 5 schools, 39 out of 98 elementary, middle schools and span schools, not including charters, were rated in the lowest-performing categories — orange and red — in both English language arts and math on the California School Dashboard. That’s about 27,500 students not meeting academic standards, according to the analysis by Parent Revolution, a nonprofit parent empowerment organization. Only six of those schools — representing about 3,000 students — were proficient in both English and math, meaning they show up in the green category on the dashboard. School choice. Parents find very complicated the process of moving their children from one school to another, either within or outside the district. Immigration fears. Undocumented parents don’t feel safe enough to be involved with their school’s community. Gentrification. Latino parents feel rising housing costs are forcing them to leave their neighborhoods, which then drives down enrollment in the public schools. Responsiveness. Many parents are not finding that their local districts are helpful in solving their issues. The final list of candidates was released by the Los Angeles City Clerk Elections Division when the deadline closed Tuesday. Now the next step for the 17 individuals is to submit a nominating petition with at least 500 valid signatures from voters in the district by Dec. 5. If all of the candidates qualify to move forward in the election, it will be a crowded ballot. In comparison, this month there were 18 people vying for San Francisco’s school board — but that was for three seats on the board, not just one. The District 5 board seat — one of seven on the school board — was left vacant by Rodríguez, who resigned in July after pleading guilty to political money laundering charges. One month later, the school board voted 5-1 in favor of holding a special election to fill the seat and opposed an effort to appoint an interim representative. Board member Scott Schmerelson had proposed the temporary appointment of former board member Jackie Goldberg, but the motion was defeated. At that packed board meeting on Aug. 21, a predominantly Latino lineup of parents, advocates and community members put pressure on the board to move forward with the special election without the temporary appointment of Goldberg, who is white and had strong support from the teachers union, or any other appointment, which they felt was an attempt to exclude them and their input. The special election will be held March 5, with a runoff on May 14. The winner will fill the seat for the remainder of Rodríguez’s term, through December 2020. Before Rodríguez was elected, District 5 had been represented by white school board members for 16 out of 20 years. Latinos make up 57 percent of the voters in District 5. When Rodríguez beat incumbent Bennett Kayser in 2015, voter turnout in the district was only 12 percent in the primary election. Two years ago, the LA Unified school board elections were the most expensive school board race in the nation’s history with $17 million spent for the two seats won by Nick Melvoin in District 4 and Kelly Gonez in District 6. *This article has been updated to correct Eduardo Cisneros’s job title. He was field director for former board member Yolie Flores.